November’s general meeting had members and guests busy with several program items and a novel prize auction at the end. Questions and Answers, led by Lawrence Charters, informally began the event, and two mini-training sessions followed. Pat Fauquet and Travis Good each led a session while our principal speakers, Raul Arriz and Mark Gruen of Absolute Mac prepared for an iLife ’06 presentation that transitioned into a demo of two Mac musical programs. Steve Roberson informed and amused us with his annual holiday “Top Ten Mac Gifts Under $100” presentation. With only minutes to spare, we ended the program by auctioning off three top-notch prizes with the winners redeeming their recently issued Pi Dollars. Q & A – In a return to our roots, the meeting began with a Question and Answer session, with Lawrence Charters at the front of the room fielding questions. With the first arrivals showing up at around 8:40 a.m., he started addressing questions from these early arrivals, and, while the large meeting room was being modified into three separate sections to accommodate the mini-training sessions, he continued without missing a beat. Other than having to twice quiet a boisterous group near the coffee and snacks, he was ever busy answering several diverse questions. He took one last question just after nine o’clock, at which time we broke into the two mini-training sessions. Good job, Lawrence! Sign-In Changes — Our sign-in procedure has been expanded to incorporate our new participation award program called Pi Dollars. The program is explained more extensively elsewhere. Volunteers were kept busy making sure each member received all their earned credits to include the one thousand for attending this meeting. Each person was given a Pi Dollar bill with validating information on the reverse side. Each member could then review how much they had to spend at the final prize auction. Mini-training Session B – Travis Good led a parallel training session with the central topic being iPhoto 6. Travis was well prepared with a Keynote presentation that effectively took the audience through the most important features of this popular Mac program. He demonstrated how photos are imported as Rolls and how they can be manipulated and then organized into Albums. His presentation was thorough, so there were few questions from the audience, which was riveted to his every word. Travis once again proved to be an outstanding speaker, knowledgeable about the Macintosh and able to convey that knowledge clearly. We look forward to the next time he can do a presentation. Thanks Travis, great job! Raul Arriz and Mark Gruen from Absolute Mac were the principal presenters for the meeting. Raul did the bulk of a demonstration of iLife ’06 that entailed showing the audience the basics of the iApps bundled in that software package. He showed us how iTunes music flows seamlessly into iPhoto and iMovie. In just minutes, he built a Web page using the new iWeb application. With time running out, he turned the stage over to Mark, who wowed the audience with the capabilities of GarageBand and Apple’s sophisticated music software program, Finale. The music on the Mac portion of the presentation had many folks expressing an interest in wanting to know more. At the beginning of Raul’s presentation, he introduced the subject of restarting the iLife SIG as well as initiating a new Music SIG. He asked some pertinent questions to gauge the crowd’s interest and sent around sign-up lists to get things moving. This promises to be another opportunity for members to learn more about these popular applications from Apple. Anyone interested in these new SIGs can contact Raul at raul@mcis.com to get more details and sign up. With time running out, Steve Roberson presented his latest version of the annual Top Ten Mac Gifts Under $100. Steve is a fine public speaker and he had everyone involved and amused. His gift ideas, save one, were all under one hundred dollars and some of them were quite innovative. Of course, the number one gift was a repeat from years past, and it was a membership in Washington Apple Pi, naturally! Steve, superb job! We closed the meeting with the awarding of prizes. We had three great items to give away, and for the first time we were going to hand them over to the highest bidder of Pi Dollars. This form of currency is a recent innovation to reward members for participation in Pi events and activities. Steve Roberson was coaxed to be the auctioneer and he ably filled the role. 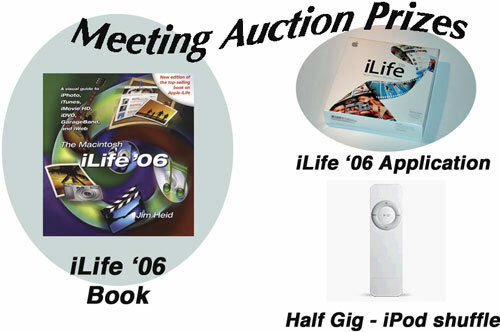 We “sold” an iPod speaker set to Nancy Little, a new iLife ’06 book to Paige Counts and a copy of iLife ’06 to Jim Little. This event was a fitting end to the jam-packed agenda. This gathering was our swan song meeting at the Microsoft Center in Reston. We have Len Adler and, his son, Kevin to thank for the wonderful facility that was made available to us at no cost. Beginning in January, the general meeting will be held at Luther Jackson Middle School in Falls Church. The starting time has also been shifted to 9:30 a.m. and the street address is 3020 Gallows Road. The agenda for the meeting is posted elsewhere in this issue of the Journal. Stay tuned for updates and see you there! Grab a brochure in JPEG or PDF.